Gives Lifted, younger contours return. 100% Natural. Provides daily support for delicate eye areas. 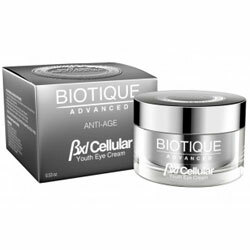 This luxurious eye cream provides daily support for delicate eye areas. See lifted, younger contours return. Powered by exclusive BXL Complex for the most energizing, nourishing and strengthening skin effects. Apply a thin layer of cream on dark spots. Leave on 15-20 minutes. Rinse. Use daily or as needed.